YMCA Norfolk, in partnership with Broadland YAB, held an event on November 6th 6.30pm – 9pm to support health and wellbeing for young people in the Broadland community. The event was hosted by Acle Youth Club and young people who attend the youth club assisted in designing the event. A range of agencies attended the evening, providing advice and information to young people: Wellbeing Service, Pets as Therapy Dogs, Carers Trust, Broadland District Council, YMCA Volunteering, Terrance Higgins Trust and Library Service. YMCA Norfolk would like to say a huge thank you to all services that offered their support. “It was a brilliant night celebrating health and wellbeing, filled with fun but also providing young people with important information about where to go for help and support. We were able to showcase video clips produced by the young people in partnership with Copper Crayon celebrating positive body confidence. A massive well done to all those young people from Broadland,” said Jess Tyson, YMCA Norfolk Youth Engagement Worker. 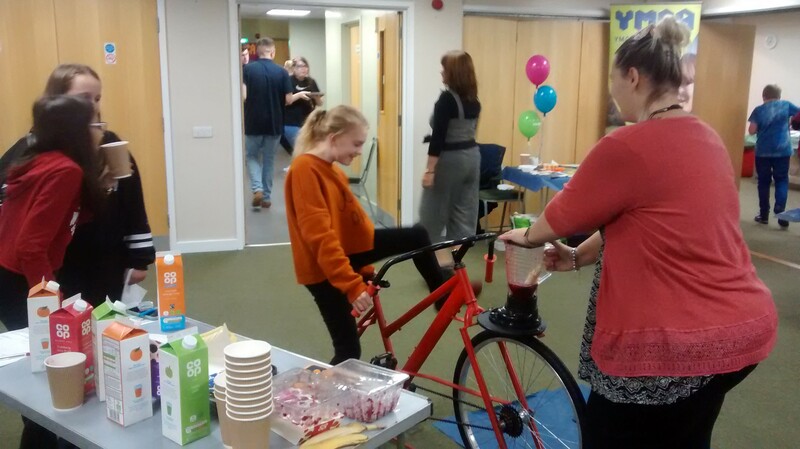 Other activities on offer for the young people included making stress balls, smoothie bike, glitter face painting and showing the body confidence clips created by Broadland young people. YMCA Norfolk are hosting another Health and Wellbeing event next spring also funded by Broadland YAB.